In 2014 23% of U. S. adults identify themselves as religious “nones,” which is a dramatic increase from just seven years before, when “nones” made up 16% of Americans. Of Americans born between 1981 and 1996 (a.k.a., Millennials), 35% are atheists, agnostics, or “nothing in particular” religiously. In 2014, the median age of the “nones” was 36, which is one decade younger than the median age of American adults. As regards religious switching, four Americans have become “nones” for every one who has moved from being a “none” to being religiously affiliated. Interestingly, there is a geography to the religiously nonaffiliated. Some of it is what one might expect. That is to say, there is a much higher concentration of the religious “nones” in New England, the Pacific Northwest, and the Mountain West (excluding, of course, Utah). Really? In our next post, we will talk about this demographic surprise. 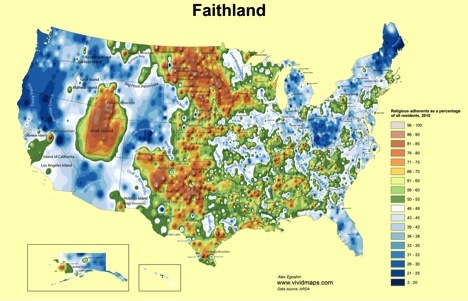 Faithland map, 2018. Created by Alex Egoshin using data provided by the Association of Religion Data Archives. Hmmm . . . southern Ohio and West Virginia. I look forward to your next column!